Adult chinch bugs are black with white wings folded over their backs and measure about 4mm long. Newly hatched chinch bugs or ‘nymphs’ are yellow upon hatching but soon turn red, with a light coloured band across their abdomens. With each molt, nymphs more closely resemble the adults. Chinch bugs live in the thatch layer of a lawn where they feed on the grass by piercing the plant with their mouth and sucking the plant juices. When the chinch bugs feed, they release enzymes that facilitate easy feeding. The enzymes continue damaging the plant after feeding, and cause the grass to turn brown and potentially die. Chinch bugs are generally found in hot sunny areas of a lawn. They tend to aggregate, which initially results in localized dead patches. These dead areas are brown, irregular sunken patches, which can coalesce into larger dead areas. Damage generally becomes evident in July and August when temperatures get hot and drought conditions become more prevalent. Heavy infestations can be identified by simply parting the thatch and looking for the chinch bugs. Light infestation can be discovered by cutting the bottom from a large tin can and pushing the can into the lawn and filling it with soapy water. Any chinch bugs present will float to the surface. The adult chinch bug spends the Winter congregated under trees and shrubs, as well as on the edges of lawns, under hedges and in flower beds. As the temperatures become warmer in Spring, the adults move into the lawn and begin depositing eggs. As many as 20 eggs per female may be laid during May and June. The eggs take about 20-30 days to hatch at temperatures below 21°C but can hatch in as little as a week when above 26°C. The nymphs grow slowly at the beginning of the season because of cool temperatures but speed their development by July. Damage may be visible from late June through August. When cool temperatures arrive, the mature chinch bugs seek out protected areas to spend the Winter. Chinch bugs are common lawn insects that can cause extensive damage if left untreated. They live in the thatch layer of a lawn, where they feed on the grass by piercing the plant with their mouth and sucking the plant juices. When chinch bugs feed, they release enzymes that facilitate easy feeding. 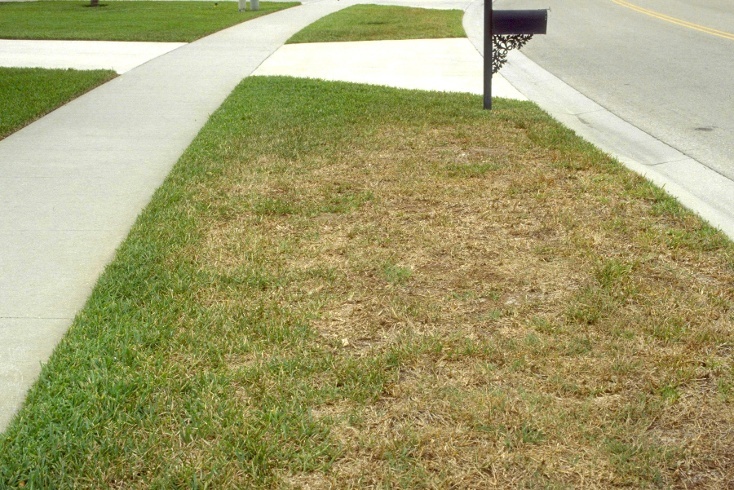 The enzymes continue damaging the plant after feeding, and cause the grass to turn brown and potentially die. Chinch bugs are generally found in hot, sunny areas of a lawn. They tend to aggregate, which initially results in localized dead patches. These dead areas are brown, irregular sunken patches, which can coalesce into larger dead areas. Damage generally becomes evident in July and August when temperatures get hot and drought conditions become more prevalent. Chinch Bugs are tiny, but don’t let that fool you; they can cause major damage to your lawn. The damaging nymphal life stage of the chinch bug is bright red in color with a white stripe across its back. In order to find them you will have to get down on your hands and knees and spread the turf apart. The best place to look for active chinch bugs is in areas where the stressed turf meets the healthy turf. Here are our top tips for preventing chinch bug infestations, and to recover from them. 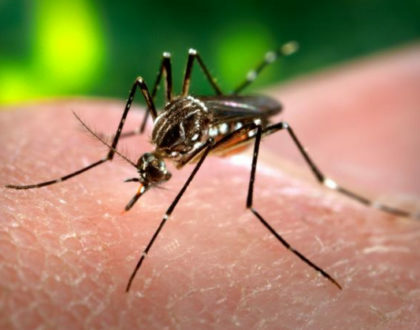 Since this pest requires hot dry conditions for optimum survival and reproduction, irrigation during Spring and early Summer may increase the incidence of pathogen spread, especially the lethal fungus, Beauveria spp. The adults can withstand water because of the protective hairs on the body but the nymphs readily get wet and can be damaged by large water droplets. Overseed areas that have historically been damaged by chinch bugs with perennial ryegrasses, fine fescues and tall fescues that contain entophytic fungi. Endophytic grasses deter chinch bug feeding. Chinch bugs are rather easy to detect in turf and targeted insecticide applications can be applied to reduce populations which appear to be building to damaging levels. Talk to us about Integrated Pest Management principles effective for controlling chinch bugs. Slightly damaged turf will recover rather quickly if lightly fertilized and watered regularly. Heavily infested lawns may have significant plant mortality because of the toxic effect of chinch bug saliva and reseeding will be necessary. Major damage caused by chinch bugs is often mistaken for drought stress and not treated accordingly. It’s important to identify, treat and eliminate chinch bug infestations before they multiply and chinch bug damage becomes extensive to a lawn.